Hello dears! It's happy humpday, and hopefully your week is going well. Today I have a short day and will be picking up LO from the daycare after a business lunch. I'm looking forward to spending some alone time with her, and maybe getting a chance to get some groceries(no easy feat these days!). I'm glad that I'm not spending the day at work - HR is interviewing the staff after some incidents within the workplace so everyone has been nervous lately. To help calm me down, I started with a nice sky blue cream by Lancome marked as Ultramarine Green. There's no green in there as far as I can tell, and it seems more to me like a basic Tiffany blue shade. Coverage was incredible, I used two easy pigmented coats and achieved a wonderful smooth and shiny finish. This will definitely become a staple in my collection and I hope to add more Lancomes in the future. No topcoat in these pics. Next, I wanted to add some simple and sweet sparkle to this lovely shade of blue, and so I layered one coat of LA Splash Ocean Sprinkles. It's a blue jelly based glitter polish with iridescent hex glitter and shimmer. I had no difficulty with the application and the glitters applied smoothly with no clumping or patchiness. I finished with a layer of topcoat to smooth everything out. I did try using Ocean Sprinkles on its own because I thought the base would build up to opacity, but unfortunately after three coats it was too sheer to wear on its own. This IMO definitely needs undies of some sort, and possibly could be layered over a darker shade like navy or black. Overall I really liked the layering combination because it indeed was calming yet cheerful to wear during some stressful times at work. The glitter isn't too in your face either, so it's easily work appropriate. I like how the iridescent glitters capture some pink sparks when in the right angle of light, and somehow Ocean Sprinkles does have the essence of ocean sprinkles when you catch the glimmer. It's like looking over the ocean with the sun hitting the waves and making the water sparkle in the distance. I noticed that LA Splash has other glitters on their website and now I'm tempted to check them out. Have you tried any yet? I'm surprised how nice the formula was for Lancome! I would love to try more, I just wish the price tag wasn't so hefty for their creams. Thank you! I hope you can find this blue! I got mine in a swap and it's a mini not a full... but maybe it's part of their core. 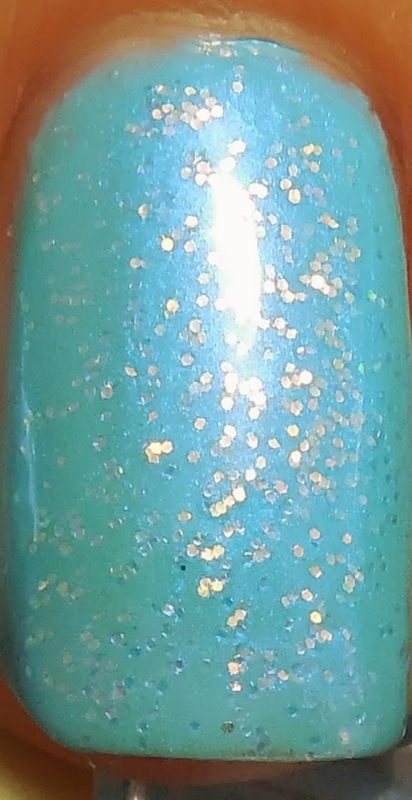 Ocean Sprinkles is so pretty! I've always wanted to try the brand. The Lancome is also a lovely color. Thanks! You should try your local Ross - I've seen some multi packs of the LA Splash polishes there. I also picked up a few during a cherryculture.com sale before.